Give someone you know who is battling or has battled breast cancer hope. This beautiful piece of breast cancer awareness jewelry will what they wear to symbolize their strength in this fight. It's subtle, unique, and will help make others aware of their passion for spreading breast cancer awareness to others. This 1” Nickel-Silver disc may be hand stamped with any name in Bradley font. A zinc alloy charm is included to help spread the awareness of breast cancer. The ribbon charm measures 14x16MM in size and features pink crystals. Choose to stylishly hang this awareness pendant from an 18” silver plated necklace, a heart key ring or a circle key ring. Free personalization is included. This custom necklace is a great piece of breast cancer awareness merchandise for anyone looking to show their support of the fight against breast cancer. Additional Info We offer a fantastic variety of breast cancer awareness products that will give hope to those who are currently battling or have battled the disease. 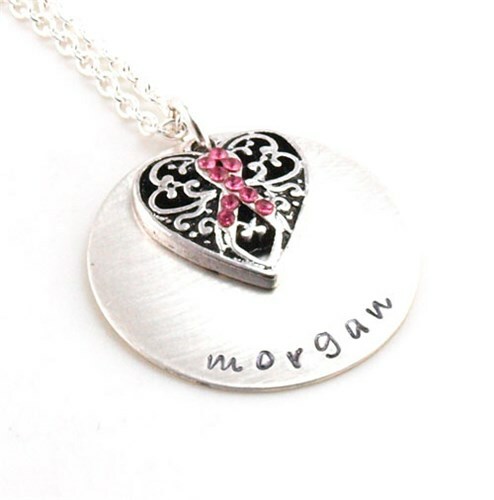 This stunning pendant is one of a few jewelry pieces that we have, such as this Pink Ribbon Circle Frame Necklace.